Portwell, Inc., (http://www.portwell.com.tw), a world-leading innovator in the Industrial PC (IPC) market and an Associate member of the Intel® Internet of Things Solutions Alliance today announces the release of the PCOM-B639VG, a Type 6 COM Express Basic (125mm x 95mm) module based on the 6th generation Intel® Core™ processor and Mobile Intel® QM170 chipset (2.6W). 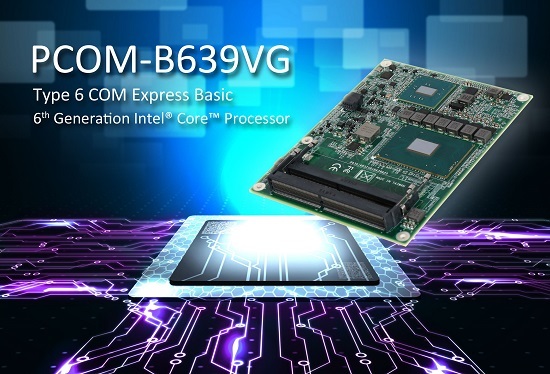 The COM Express module includes Intel® Turbo Boost Technology for faster processing, Intel® vPro™ Technology for superior remote capabilities and Intel® Hyper-threading Technology for multithreading. Supporting three symmetric independent displays, the PCOM-B639VG is designed with the 6th Generation Intel® Core™ Processor, built on 14nm process technology utilizing multi-stream technology, resulting in up to double the performance of the integrated GPU and improved energy efficiency. These features translate into reduced manageability cost and improved security capability, making the PCOM-B639VG an ideal solution for Networks Systems, Digital Signage and Retail Systems.